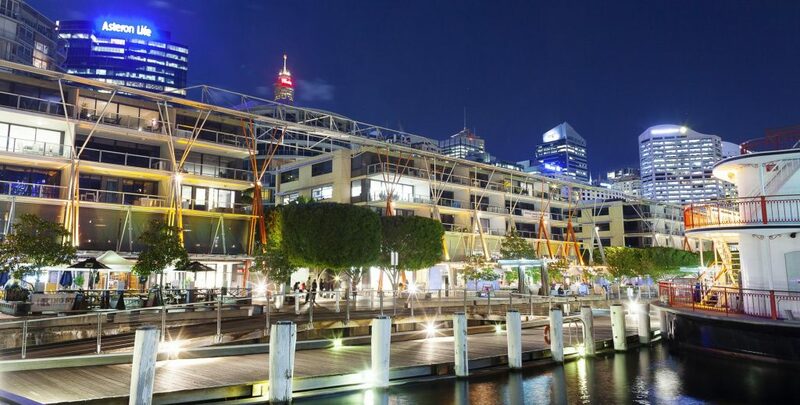 Private real estate group Markham has swooped on Sydney’s Darling Harbour waterfront precinct, paying $125.5 million for the 99-year leasehold of the popular King Street Wharf development, reports The Sydney Morning Herald. Located next to the $6 billion Barangaroo precinct, King Street Wharf was the first major project to be built in the area, opening just before the Sydney Olympic Games in 2000. The fully occupied, 7700-square-metre waterfront precinct, home to Cargo Bar and other well-known Sydney establishments such as Bungalow 8, was sold on behalf of the vendor by JLL and Stonebridge Property Group at a fully leased yield of 6.02 per cent. The average lease for the 14 tenants is 11.9 years. Multiplex developed the property and sold the leasehold to LaSalle Investment Management in mid-2016 for about $90 million. The Darling Harbour location has seen significant changes in recent years with the bordering Barangaroo precinct introducing large numbers of office workers and visitors, as well as other hospitality and retail options, says the AFR. The deal marks the second major CBD asset acquired by Markham in recent years. In 2016 the group bought the 179 Elizabeth Street building for 148.8 million, which was also acquired from LaSalle Investment Management. Like many recent buyers of retail assets, Markham is best known for its active approach to property and has particular expertise in Sydney Harbour assets, notes The Australian. The Sydney-based group’s penchant for targeting high-quality real estate where it can add value could see it seek to reposition aspects of the well-known King Street Wharf. JLL’s head of retail investments, Simon Rooney, said investors continued to target retail assets in CBD locations that would benefit from growing tourism spending, employment growth and rising inner-city, high-density residential space. He said CBD retail assets offered strong income growth potential relative to other retail assets. “The Sydney CBD is undergoing major changes in terms of new commercial and residential construction, upgraded transport infrastructure and new hotels and tourism-related development, all of which will drive retail and food and beverage spending over the long term,” he said. In Sydney alone, there has been close to $1 billion of retail properties change hands in the year to date, including half shares in the historic Queen Victoria Building, The Galleries and the Strand Arcade. With inner-city pubs feeling the pressure of early closing and a shift in patrons’ demands from just drinking to more a “food and beverage” experience, restaurants and cafes with water views are gaining in popularity. Research released recently by Real Capital Analytics, however, suggests that commercial property price growth is slowing, following two successive quarters of decelerating growth. The research showed that industrial and retail property in Sydney continued to grow in the first nine months of the year but has since showed signs of pulling back.